Fluorochemicals Market size is set to surpass USD 70 billion by 2024; according to a new research report by Global Market Insights, Inc.
Growth in development of efficient storage which requires commercial cooling systems for packaged and frozen food will drive fluorochemicals market size in refrigerants application. Rising installations of HVAC and air-conditioning systems in automotive and household applications should promote product demand. Increase in vehicle production with technical advancements may act as another driving factor towards industry growth. Increasing applications of blowing agent in foamed plastics manufacturing which are further used in variety of applications including weight reduction, convenience, comfort, cushioning and energy dissipation in automotive and electronics industry will have positive influence on fluorochemicals market growth. Key players are engaged in formulating low global warming potential (GWP) blowing agent for polyurethane foams which may stimulate product demand. Growth in aluminum production to cater its demand in various end use industries including transportation, electronics, construction and foil & packaging may contribute towards industry growth. Fluorocarbon are used for aluminum production through electrolysis which is a cost effective and energy efficient. Favorable FDI policies are likely to boost aluminum production which may favor fluorochemicals demand. Germany fluorochemical market size is anticipated to reach USD 3 billion by 2024. Strict regulatory norms restricting use of fluorocarbons such as HCF and HCFC which may cause environmental damage may act as a restraining factor. However, innovations to develop HFO compounds which will have low ozone depleting potential will drive fluorochemicals demand. 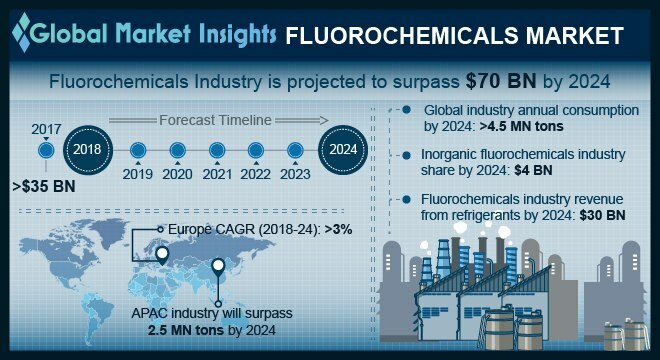 High prices of fluorocarbons owing to phasing out policies with increasing demand and less supply may hamper industry profitability and affect fluorochemicals market price trends. In addition, inclusion of high compliance cost owing stringent regulations will limit industry growth. Inorganic fluorochemicals market size is estimated to reach up to USD 4 billion in sales by 2024. Increasing usage of sodium fluoride in dental care as a toothpaste additive owing to its functional benefits of preventing cavities and making teeth stronger and more resistant to decay will promote product demand. Fluorocarbons market size from HFO (Hydrofluorocarbon) may witness steady gains at over 9%. Increasing preference over other fluorocarbons owing to favorable regulatory policies by EU Commission for adoption in mobile air conditioning systems to reduce emissions will have positive influence on fluorochemicals demand. India fluorochemicals market size may exceed to USD 3 billion by 2024. Growth in automotive and electronics industry owing to rapid industrialization and upgrading consumer lifestyle will surge regional product demand. Moreover, supporting FDI policies has led to rise in automotive and aluminum production which will bolster regional product demand. Global fluorochemical market share is consolidated and competitive. Key industry participants are Dupont, 3M, Daikin, Pelchem, Mexichem, Solvay, Asahi Glass, Halocarbon products and Arkema. Industry is characterized by product innovations to develop alternatives reducing environmental effects which will stimulate product demand.